As part of a native/original review it is expected that some files will come in that will not be displayed in Lexbe eDiscovery Suite Platform properly. That is because when we TIFF or PDF files, we will process for review only the files that will render as pages. The same will not occur in a native review, where everything gets uploaded that makes the date and keyword cull, not being DeNISTed. Native review is much less expensive from the processing cost perspective but it does mean that some files are more difficult to work with--certainly more difficult than ones that could be converted to PDF or TIFF. > password protection, corruption, file type unsupported, very large size, call outs to external servers from database driven web pages, etc. The variety of file types and issues is infinite and problem files are to be expected in a data set of this size. The number of files you have found with problems is not at all large for a data set of over a quarter million files. Large PDF files can take several minutes to display on the 'Original' or PDF tabs from the Document Viewer and internet speed can also slow the view. The time to open and even download a big document may vary greatly depending on your internet speed. Those files can also take up time during the review process causing the Text page to not fully load in or time out on the reference to a remote server; therefore, not allow saving on the field edit tabs. Very large files can also be opened from the Text View and navigate navigated back/forward using the navigation arrows at the top of the page (e.g. '<Viewing 3 of 25:>'). Once you click on the title of the document and open the Document Viewer please try to switch to the 'Text' tab instead of the 'Original'. 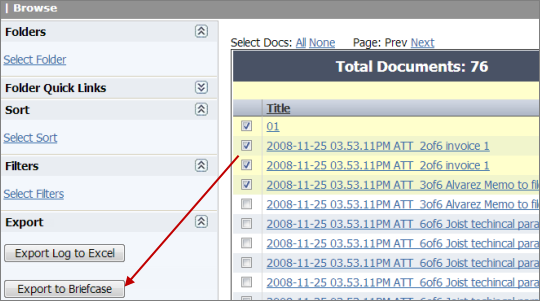 You can also 'Download Briefcase' the current file from the Document Viewer page. Another alternative is to copy some or all documents from a case onto a local computer or network in a zip file using the "Export to Briefcase" function from the Browse page. You can open native files from the Text View and navigate to the 'Next Title' in the Document Viewer. However, our dtSearch will not always extract the text on these types of files, and for this reason we recommend that file formats that are not supported natively should be converted to PDF before upload. Let's take for example text based files, including Word, Excel and PowerPoint, that may include embedded images that will not be searchable or viewable. Those can be files that contain external server calls from the web pages. The servers being called probably are not responding due to now being offline (pages are old), not responding to a web page from an internal server or other undetermined reasons. these are complex web pages and this caused our text indexed to not extract whatever human-readable text that was on at least some of the pages. >Download the original and, if it opens OK in Acrobat or another PDF viewer, print and re-scan. Then re-upload the new version. This approach obviously works better for smaller documents. After this is done, re-upload to Lexbe eDiscovery Suite Platform and check that it is properly indexing and paginating. 1) You can download these large or unusual files from the Browse screen to a briefcase. Then experiment opening with different browsers (Internet Explorer, Firefox, Chrome, etc.) from the local desktop to render. Some browsers may also contain options to prevent external server calls in advanced settings. Alternatively use a local version of various software installation utility, which will render many native file formats. As a last resort, HTML files may be opened in a text editor (e.g., Windows Notepad), but readability will be impaired as this will include raw HTML coding. To code, you would then open the edit screen from the Browse page for each document and then code from there. As the document viewer will not be trying to open the page, then you should not experience the problem of saving you experienced. 2) You can request that we process these files to PDF as a technical services job. We would take the files and convert to readable PDF using various approaches and then re-upload to the case for your review. You could then view and code as usual. >Get a better original (if one exists) and replace in Lexbe eDiscovery Platform. >Download the original currently in Lexbe eDiscovery Platform, and manipulate and resample (save) using PDF editing software (e.g., Acrobat Pro) to re-sample and save. Possibly use multiple editors or methods if needed as different editors can give different results. This is a manual iterative process and the time to work with any document can vary a lot. >Download the original and, if it opens OK in Acrobat or another PDF viewer, print and rescan. Then re-upload the new version. This approach obviously works better for smaller documents. After this is done, re-upload to Lexbe eDiscovery Platform and check that it is properly indexing and paginating. >Sort on Pages and look for documents with 1 and a small number of pages, but a large Words or Size value. We recommend that for very large PDFs upload projects or deadlines, users contact us to learn about our eDiscovery services and bring additional resources to help you. Please note that the data-related troubleshooting services here are not part of our standard free support, and we completed them today because of the Critical nature of your request. If you want us to use our technical services, please contact your sales representative, Mr. Mark Norris (512-686-3382 and mark@lexbe.com). Please let us know if you would like to convert these documents, or need support by contacting customer service at our Support Center or send us an email.